I’ve always been a history buff. I think learning about people and cultures of the past and how they affect the present is fascinating. I also love lining up world history with Biblical events and writings. Learning about the culture and circumstances surrounding a particular book of the Bible or Biblical event adds context and a depth of understanding you wouldn’t have otherwise. 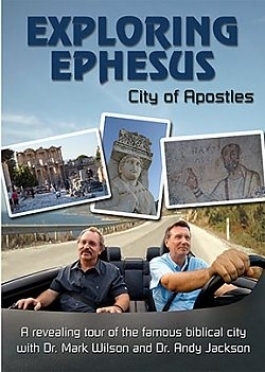 A few weeks ago, I had the opportunity to review the newly released DVD Exploring Ephesus: City of Apostles from FishFlix.com. The hour long DVD is styled like a travel show, hosted by Biblical and historical experts Dr. Mark Wilson and Dr. Andy Jackson. Ephesus plays a uniquely important role in Biblical history. It was the hub of Christianity in the early church, and it served as a home base for the Apostle Paul for three years, as he worked to spread the Gospel in the Roman province of Asia. He wrote his first letter to the Corinthians from Ephesus. It’s the site of the famous (or infamous) riot in Acts chapter 19, and is one of the seven churches mentioned in the Book of Revelation. It’s also the traditional location where the Apostle John spent his last days after returning from exile on the island of Patmos, and wrote his Gospel and epistles. Not to mention, it happens to be one of the best excavated and reconstructed Greco-Roman cities in the world. All of these things are discussed in the course of the movie. We get to visit the Temple of Artemis (one of the seven wonders of the ancient world), the amphitheater where the riot took place, the agora where Paul would have worked as a tentmaker, and other significant landmarks – even the Apostle John’s tomb! There are also trips to Laodicea, the site of another of the seven churches mentioned in Revelation, and the island of Patmos, where the Apostle John received the vision that he wrote down the book of Revelation. The DVD also has several bonus features, including discussions and insights on the book of Ephesians and the seven churches mentioned in Revelation. Exploring Ephesus would make a great addition to a study of Ephesians or Revelation for a small group, Sunday School, or youth group. It’s probably not going to hold the attention of younger children, but high school through adult will enjoy it and the insights and context it offers to the Biblical books. Click the graphic below to read what others thought of Exploring Ephesus, and five other titles from FishFlix.com.